Your teeth are extremely strong not just because of the enamel, but also due to the fact that they are rooted in your jawbone, which provides a sturdy foundation. When one goes missing, most replacements only bring back the part of the tooth you can see, which inherently makes them much less stable and reliable. Dental implants, on the other hand, bring back both the crown and the root, creating something that is the next best thing to nature. At New Haven Dental Group, we can fill in any gaps in your smile using this one-of-a-kind solution, and unlike other dental offices, we’ll be able to provide everything you need in one convenient location. 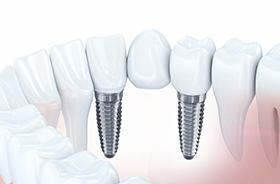 Security: Dental implants consist of a small titanium post that is placed into the jawbone that mimics a tooth root, and this is used to support a restoration seen within the smile. Because the new teeth are rooted within the strong bone, patients don’t have to worry about them moving around no matter what they are eating. Aesthetics: Implants are built just like natural teeth, which means they look just like real teeth as well. Only you and your dentist will know which teeth aren’t your own! Bone Loss Protection: The jawbone relies on the roots of the teeth for support, and without them, it will slowly shrink and atrophy as time goes by. Implants are the only treatment that can prevent and even reverse this process, which helps maintain the health of the bone as well as the shape of the face. 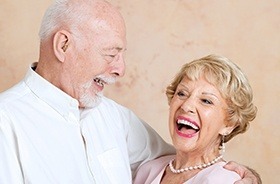 Longevity: With routine oral hygiene, a dental implant can often last for 30 years or more. Instead of using a bridge to replace a single tooth (which requires us to file down the teeth surrounding the gap), we can place an implant-supported crown directly into the smile without disturbing any of the remaining dental structure. 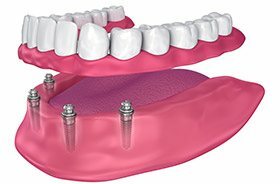 While single implant crowns can be used to restore nonconsecutive missing teeth, just two implants can help secure a bridge that holds up to 4 teeth in a row. This is a much more conservative and cost-effective solution that still delivers fantastic results. If you’re missing several teeth or are tired of your denture always slipping out of place, we can use 4-6 implant posts to give you a prosthetic you never have to worry about. Implant dentures not only have a much stronger hold compared to regular ones, but the initial fit can be trusted to last for years at a time as well. 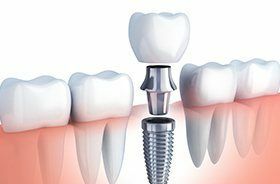 Dental implant roots have to be surgically placed into the jawbone, and with most other dental offices, they will refer you to an expensive outside specialist to have this procedure completed. At New Haven Dental Group, however, we’re able to perform the entire implant treatment ourselves in-office, saving patients time, money, and stress while they rebuild their smile. With us, you’ll have the peace of mind of being able to work with the same doctor and team the entire time. One of the best parts about dental implants is that they are so versatile, as they can be used to replace virtually any number of teeth. Because of this, there isn’t a set price for the treatment—it varies from patient to patient depending on how many implants are needed and what kind of restoration is used. Before we begin treatment, we’ll be sure to go over all pricing information with you so there are never any surprises. 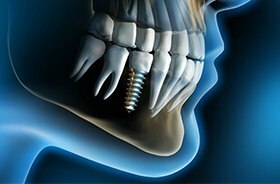 While implants are certainly a big investment in your smile, we believe they are more than worth it. 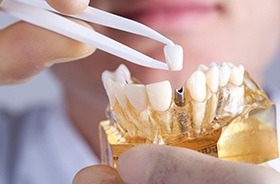 In addition to having better aesthetics and function compared to all other treatments, they are also extremely durable. 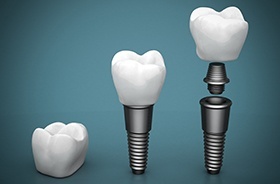 Implants can be expected to last for 30 years or more, much longer compared to regular dentures and bridges that normally need to be replaced every 5-7 years (which means they usually end up costing a patient more in the long run! ).